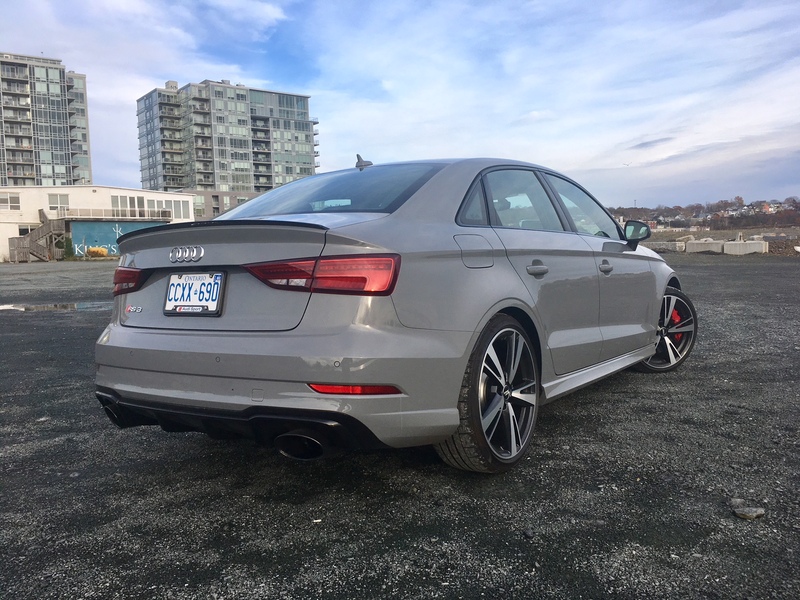 When Audi first debuted the S3 at the Canadian International Auto Show back in 2014, I remember sitting in it, getting out, sizing it up and down and then saying to myself, perhaps even out loud, “this is going to be my next car”. It looked sharp, clean, and conservative yet eye-catching. It was cosmetically enhanced perfectly. 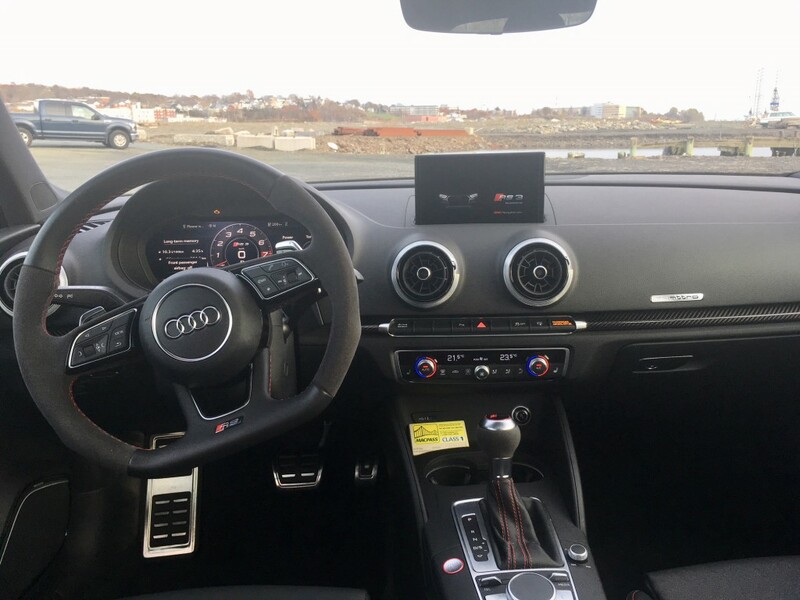 The interior was typical Audi – that is to say heavy with smart tech and quality. The 2.0 litre turbocharged four which makes 292 horses and 280 pound feet of torque was going to be a nice upgrade from my BMW 1-series’ 230 horses and 200 pound feet of torque, not to mention the added benefit of two more doors and all-wheel drive. I knew it had to be my next car. My 128i still happily resides in my garage to this day, and I am pleased that I decided to keep it. 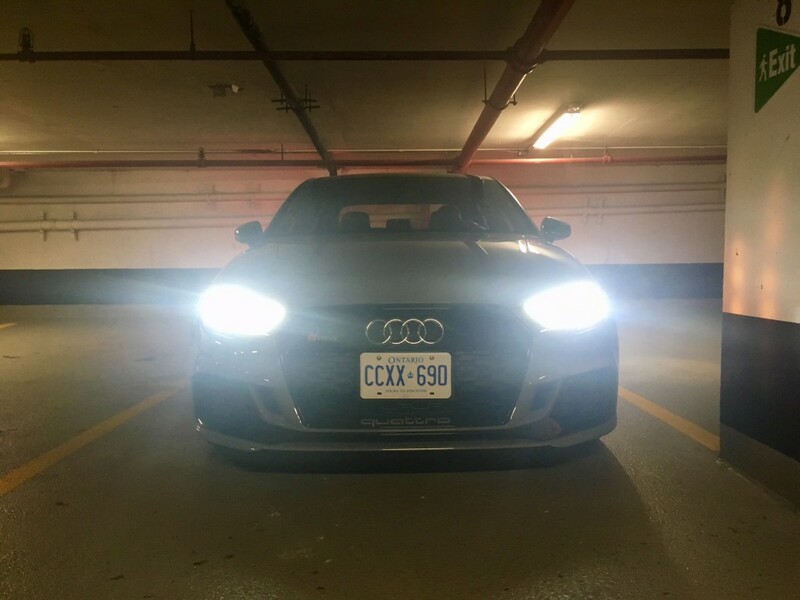 Not only does it continue bring a smile to my face after all these years and no longer burdens me with car payments, but I would have kicked myself for trading it in for an S3 now that the RS3 has come to fruition. That’s right, Audi’s smallest sedan has been given the RS treatment. What does that mean? Well, visually, it means quite a difference, though in typical German fashion, all visual enhancements are subtle – some flared wheel arches here, a lip spoiler there. 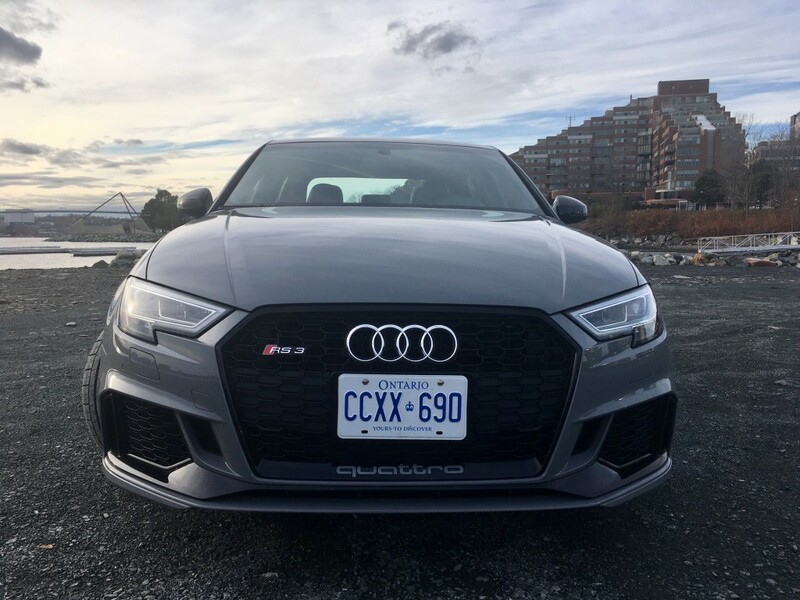 Aside from the bigger grille along with RS badging, the RS3 can be differentiated from the more mundane-by-comparison S3 by the large ‘Quattro’ insignia on the lower lip of the grille (Quattro is Audi-speak for all-wheel drive). All RS models going forward will get this treatment. My tester came with the ‘Black Optics’ package which essentially replaces the brushed aluminum trim all around the vehicle with glossy piano black pieces. This contrasted nicely with the Nardo Grey paint. Staggered 19-inch wheels are standard, but in Canada, you get your choice of four different styles. The 5-arm blade design with glossy black inserts were fitted to my tester and this is the only area where the design is lacking for me. 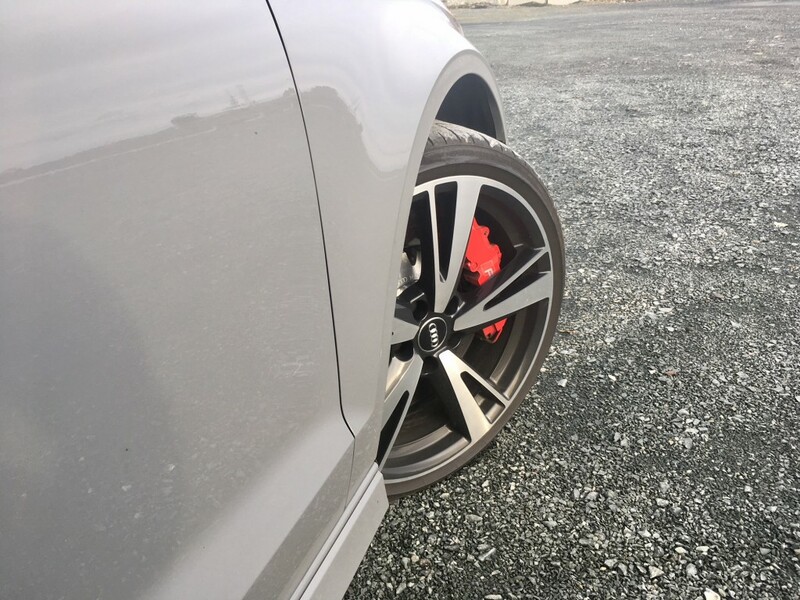 Having parked next to my neighbour’s Honda Fit EX, I noticed that the wheel designs were a bit similar, only the Audi’s were noticeably larger. RS models should not have any similarities to mere sub-compacts. Do yourself a favour and get one of the rotor-arm designed wheels – they fits the vehicle’s design much better. Despite the prestigious reputation that Audi holds for luxury, the interior is all business – making performance the priority. That means bucket seats with aggressive bolstering, it means easier-to-grip suede on both the flat-bottom steering wheel and the gear shift knob. It means red contrast stitching throughout along with thigh bolstering on the seats. A Lexus LS, this is not. Being the smallest sedan in Audi’s current line-up, interior space is at a premium. It certainly feels cozy and those relegated to the back seats will likely want to ask the driver for breaks to stretch their legs on longer trips. 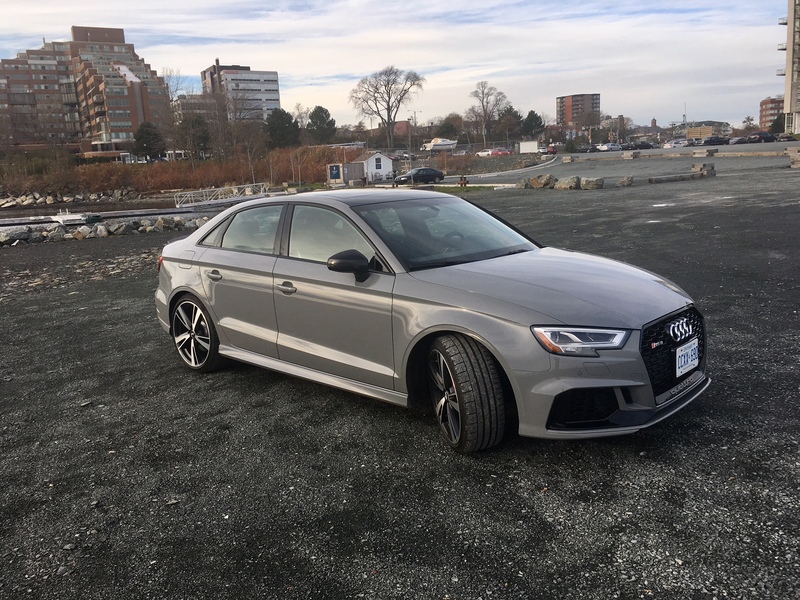 Still, the RS3 can double as a family sedan in a pinch with a decently roomy trunk, though the trunk opening itslef is quite small. We couldn’t fit my aunt’s checked bag due to the shallow opening when we picked her up at the airport. We had to put it in the back seat. That’s a small price to pay considering the RS3’s abilities, not least of which reside under the hood. There you will find a 2.5 liter turbocharged five-cylinder. Yes, you read that right, a five-cylinder. Manufacturers tend to go either four or six. The last 5-cylinder (and indeed the only five-cylinder I had ever driven up to this point) was my dad’s Volvo C30. That makes 168 horses. 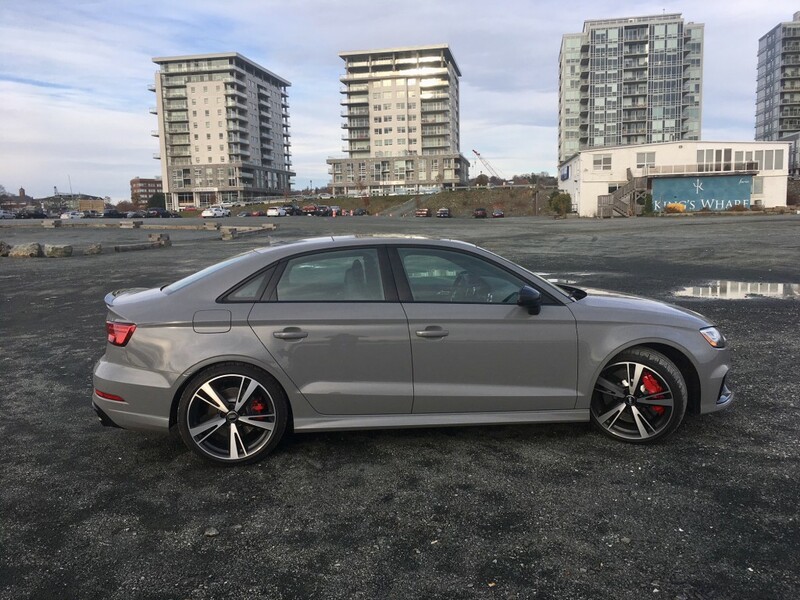 The RS3’s five-cylinder? Well it makes a whopping 400 horsepower and 354 pound foot torque mated to a seven-speed S-tronic automatic. What makes this specific five-cylinder interesting is the firing sequence of the cylinders. 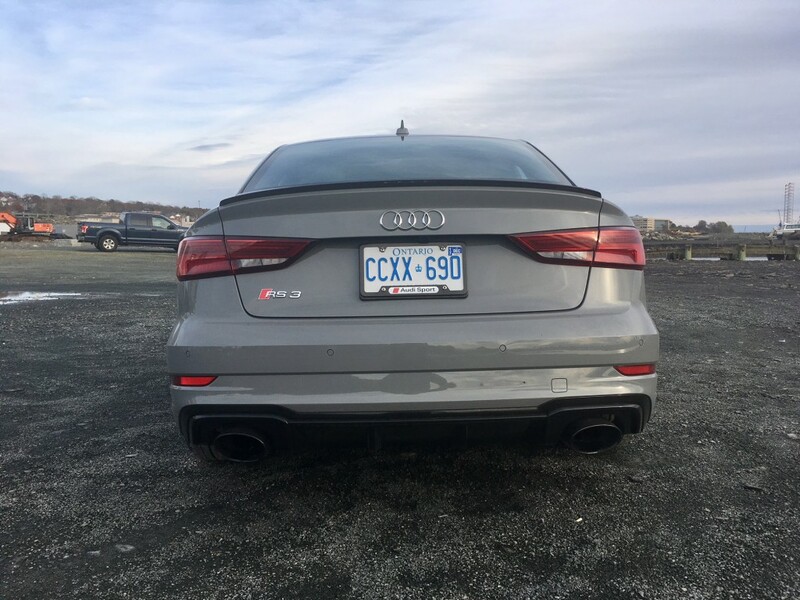 With a 1-2-4-5-3 structure, the RS3 has a very unique exhaust note. If I had to relate this concerto to another sound, it would honestly have to be a V8. It sounds brawny, the cylinders fire with gusto and the end result is a symphony for your audible senses. Indeed, it also attracts attention; there weren’t too many people who didn’t notice me as I drove past. But enough about how brilliant it sounds, let’s talk about how brilliantly it works in this car because the end result is a vehicle that can propel itself from 0-100 kph in 3.9 seconds, if done properly. To give you an idea of just how fast that is, it’s quicker than a Porsche 718 Boxter, a Lamborghini Gallardo, a Ferrari California, a Lotus Evora 400 and Maserati Quattroporte GTS. You don’t need to know a single thing about cars to know that is an extremely impressive list to be included on. 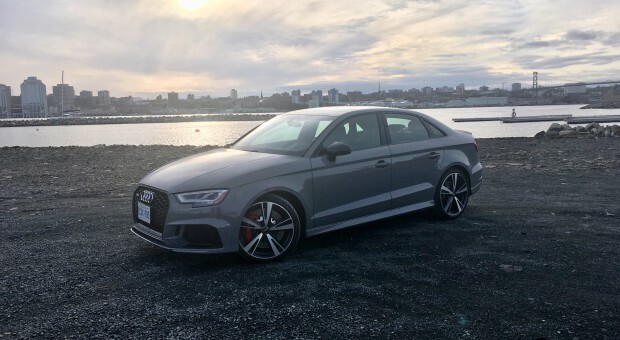 While $70,000 is a lot of money, most of the above mentioned vehicles are well into the six figure range which makes the RS3 one hell of a relative bargain. In order to achieve that sort of reputation, the RS3 must be in dynamic mode. Other modes include comfort, which is self-explanatory, and Auto. The latter adjusts automatically to your real world driving style. If you get a sudden jolt of testosterone and mash the right peddle to the floor, it will realize you rapidly want to give it the beans and adjusts throttle and engine output. Once you’ve come back to reality, it will realize that your immaturity is over and will go back to being a semi-regular sedan. There is also an individual mode which can allow you to independently select how you like the different components. So you can keep the engine and transmission in dynamic mode and keep the suspension in comfort, for instance. Unless you are on a track, this is likely the best set up as the RS3 is far from Buick-like in its ride. Those large low-profile tires don’t do much to help with comfort either. As you can imagine, the striking performance continues in the twisties. A big reason why is the extra tuning every RS model receives. Specifically for the RS3, it gets a reprogrammed Quattro system which does away with pre-torque distribution. That means the rear wheels aren’t held back – they get the most amount of power possible. The stability control and the steering feedback is also retuned along with ventilated front and rear disc brakes. This means you can confidently toss the RS3 into mostly any corner without much worry of getting it out of sorts. Be forewarned though, while the corning limit of the RS3 is hard to get to, it does indeed have one and the end result is a fair amount of understeer when grip is finally broken. Unless you are taking it to a track (which you really should) then this won’t be noticeable in the slightest. Those brakes are tremendous as well, and were very much welcomed when a small child suddenly darted out into the street in front of me in a residential neighbourhood while I was going about 45 kph. After his frantic mother got him out of the road and scolded him, he seemed pleased hearing that burble from the 5-cylinder as I continued on. I saw in my rear view mirror that he gave me a thumbs up. 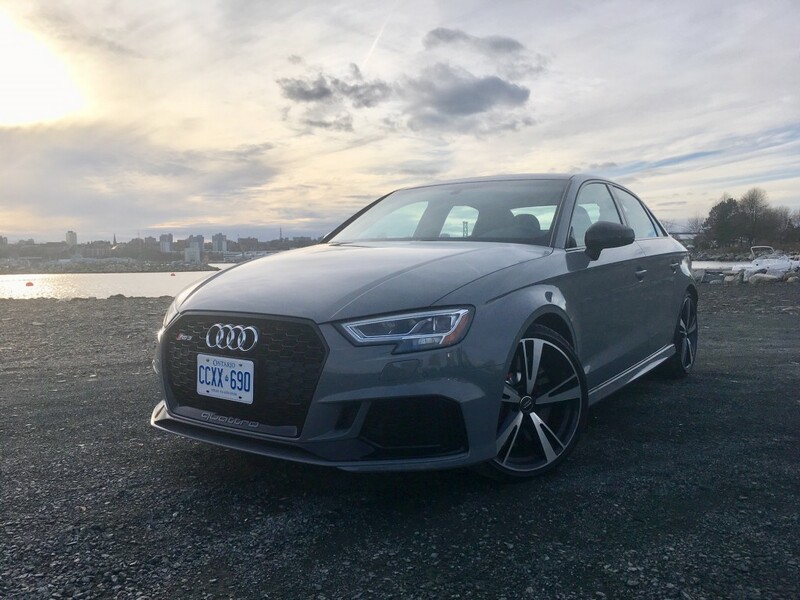 Natural Resources Canada states official fuel consumption figures for the RS3 at 12.4 L/100 kms city and 8.3 highway. In real world mixed driving, (which included a fair amount of spirited driving, admittedly) I returned 10.8 L/100 kms, which isn’t bad at all considering this vehicle’s performance credentials. With that said, you’ll be filling frequently due to the small sized gas tank. While I have been partial to the BMW M3 for a very long time, I was always intrigued by the Audi RS4 – the big brother of the RS3. It was refined, classy and discreet. It didn’t attract much attention until you really stepped on the gas and it otherwise worked as a pretty decent daily driver. 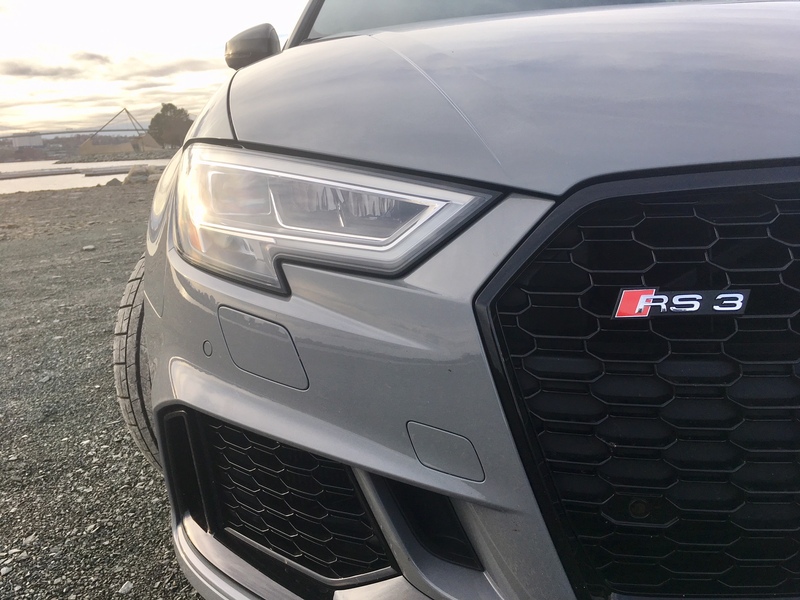 Today, we do not get the RS4 in the North American market, which I always thought was a shame. But now, I say we don’t need it. Not only is the RS3 nearly identical in size as the last RS4 to be sold on our shores, but it’s more capable. It’s lighter. It’s more nimble. It’s measurably more frugal on gas. It has superior tech. It is better in almost every single way, and to my eye, looks better as well. So when the time comes to finally say goodbye to my trusty 128i (which will still be a fair ways away), I know there’s a truly fantastic car waiting for me in the form of the RS3. Es ist recht gut!